Federal workers’ compensation laws discourage employees from returning to the job and create unnecessary and burdensome costs for federal agencies, according to the U.S. Postal Service inspector general. USPS’ workers’ compensation costs have grown rapidly in recent years, the IG found, despite drastic cuts to the agency’s workforce. The Postal Service paid $1.3 billion in benefits to employees injured on the job in 2013 -- a 35 percent increase from 2008 -- while it decreased its workforce by 26 percent in the same period. The agency maintains a $15.9 billion workers’ compensation liability. 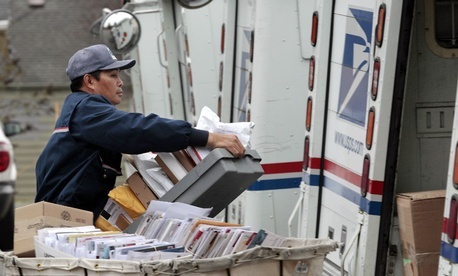 Workers’ compensation costs have grown as USPS has fewer light-duty positions available for injured employees coming back to work, employs an older workforce and endured cost-of-living adjustments. The Federal Employees’ Compensation Act, originally enacted in 1916, has amplified these problems, according the IG. The auditors said the law prevents the Postal Service from adopting many of the best practice cost control measures used by state governments and private companies. The IG said USPS would see significant savings if it were permitted to implement a time limit for benefits or a maximum total amount of compensation an employee injured on the job could collect. FECA places no restrictions on when benefits should cut off. More than 10,000 postal employees collecting FECA benefits are currently older than 55, nearly 2,000 are older than 70 and two employees are more than 100 years old. Federal employees hurt on the job now receive 66 2/3 percent of their basic salary tax-free, designed to approximately replicate their entire post-tax salary. That figure is bumped to 75 percent if the employee has dependents. Related medical expenses are also covered. A Senate committee has cleared a postal reform bill that includes a measure to overhaul FECA for all federal agencies. The new plan would trim the benefit to 50 percent of an employee’s salary, once that employee is eligible for retirement. Additional compensation for dependents would no longer be provided. The IG said several states do not provide extra benefits for employees with dependents. The Postal Service would also benefit if Congress lifted the prohibition on reaching a one-time settlement agreement with injured employees, rather than requiring periodic payments, the IG said. The payment would create closure for the workers, the IG said, and encourage them to return to work more quickly. Additional reforms should include limiting physicians to those selected by the Postal Service, expanded use of vocational and rehabilitation programs, and a requirement to use generic drugs, the IG said. The auditors pointed to the private sector’s loaning of recovering employees to charities and the maintenance of a database of light-duty jobs as examples of practices USPS should consider implementing. The IG acknowledged it would be difficult to bring about any of the recommended changes, but called on postal management to lobby for change.